These wonderful holiday specials span three major holidays – Halloween, Christmas, and Easter – and were originally aired between 1987 and 1992. For the Halloween special, Will Vinton presents the “Claymation Comedy of Horrors” where Wilshire Pig and Sheldon Snail quest for Dr. Frankenswine’s monster. A horror spoof, this special is quite entertaining and funny! 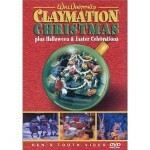 For the Christmas special, Will Vinton presents “Claymation Christmas Celebration” with many interesting and diverse characters presenting different skits during a Christmas celebration event. For the Easter special, Will Vinton presents “Claymation Easter” where Wilshire Pig tries to kidnap the Easter Bunny and of course, things go very wrong!